In 1944, a billboard outside of Oak Ridge, TN contained a warning from a grimacing Uncle Sam, “Loose Talk Helps Our Enemy. 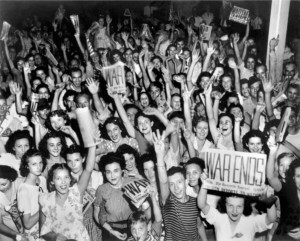 So, Let’s Keep Our Trap Shut.” As the principal site of the Manhattan Project, the American-led effort to develop an atomic bomb before the Nazis did, Oak Ridge could not afford careless chatter. 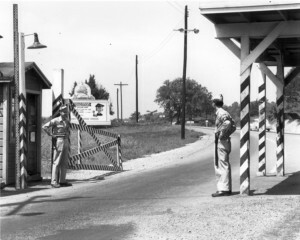 Known as the “Secret City”, Oak Ridge had armed guards posted at all entry points. From 1942 – 1946, only one person in Oak Ridge was allowed to have a camera: Ed Westcott. Previously a staff photographer for the Nashville office of the Army Corps of Engineers, Ed Westcott was the 29th employee hired by Clinton Engineer Works (a front for the Manhattan Project) in 1942. At age 20, Westcott was charged with the task of documenting life in the Secret City. Since Westcott was the only authorized photographer in Oak Ridge during the World War II era, his pictures have become invaluable historical documents, providing a one-of-a-kind window into the heart of the Manhattan Project. Read on to learn about the fascinating life and legacy of Ed Westcott. Born in 1922, Westcott developed an interest in photography as a boy. He received his first camera when he was 12 years old, a $25 German Foth Derby that his father spent a year saving up for. As a teen, Westcott charged his neighbors in Nashville 50 cents per roll to develop film in his very own lab, a converted mobile lunch wagon. A self-taught artist, Westcott never formally studied photography, yet he had an uncanny artistic ability and could capture full stories in a single photograph. Westcott’s connection to Oak Ridge began even before he was hired by Clinton Engineer Works. When he was working for the Army Corps of Engineers in Nashville, Westcott was given the assignment of taking aerial photos of East Tennessee. 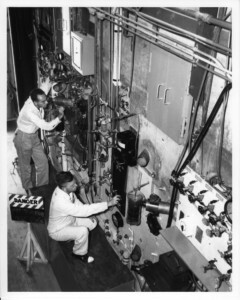 Unbeknownst to Westcott at the time, these pictures were used by analysts at the Manhattan Project as they scouted locations across the country for their nuclear site. Once Oak Ridge was officially chosen as the army’s secret uranium enrichment facility in the fall of 1942, Westcott was brought in to document the project from the very beginning. During construction, engineers would tell Westcott to take photos of specific map coordinates, which would later become railroad beds, houses, and other buildings. When the Secret City was up and running, Westcott was there to capture everything that happened behind the fence. Westcott’s photos included scientific experiments, men and women at work, military activity, and high-profile visitors like J. Robert Oppenheimer (the father of the atomic bomb). 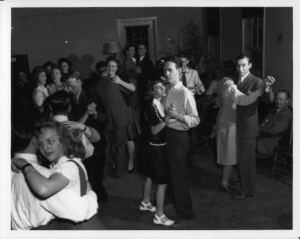 In addition to profiling the Manhattan Project, Westcott also took numerous photos of everyday life in Oak Ridge, such as children at play, orchestra concerts, and teenage dances. Film was in short supply during World War II (because it contained silver) so Ed Westcott had to be very cognizant of what he was shooting and how many photos he was taking. Westcott became a master of taking photos that were both aesthetically pleasing and filled with critical information that the military needed to preserve. In a 2012 interview with the Metro Pulse, a now-defunct weekly newspaper in Knoxville, Ed Westcott indicated that he had figured out what Oak Ridge’s top-secret mission was during the war. While most employees of Clinton Engineer Works only saw a fraction of the uranium enrichment operation, Westcott had access to the entire facility. With this insider knowledge, Westcott was able to connect the dots after consulting a chemistry book. It was well known that the United States was actively pursuing an atomic bomb, but few people living in the Secret City knew that it was happening right under their noses. 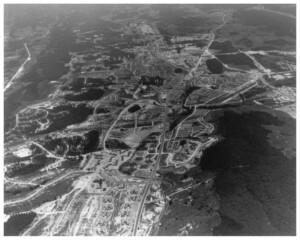 Not long before the bombing of Hiroshima on August 6, 1945, Westcott took a new set of aerial photos over Oak Ridge. These pictures were hand-delivered to newspapers across the United States so journalists could explain how America’s nuclear weapons were developed. Although Ed Westcott’s photos were locked away for many years, they have since been declassified and are on display at museums in Oak Ridge. 15,250 of Westcott’s negatives taken between 1942 and 1946 were preserved by the National Archives and Records Administration. If you would like to see Ed Westcott’s photography during your next trip to Oak Ridge, we recommend visiting the American Museum of Science and Energy, the Oak Ridge History Museum, or the Children’s Museum of Oak Ridge!